Friday marked the last day of buying groceries. Since we're leaving the country soon it's not top priority to use up whatever we have lying around and make sure that we leave as few perishable items in the fridge as possible. My recent adventures in onion soup has left us with enough onion soup to sustain us for the remainder of the year. I reserved a little and threw the rest in the freezer as not to put us off of onion soup for the rest of our lives. Last night I got a couple of nice beef short ribs, seared them, and then covered them with onion soup, braising them for about 2.5 hours. Right before they were finished I made a quick polenta with corn meal, chicken stock, ricotta, and Piave. 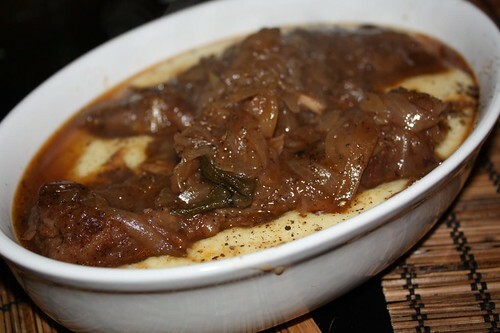 I served the short ribs in the polenta and topped them with some of the soup/braising liquid. It was a pretty fantastic meal for a cold, cold night. As we enjoyed the braised dinner I received a text message from my sister-in-law with the following image. 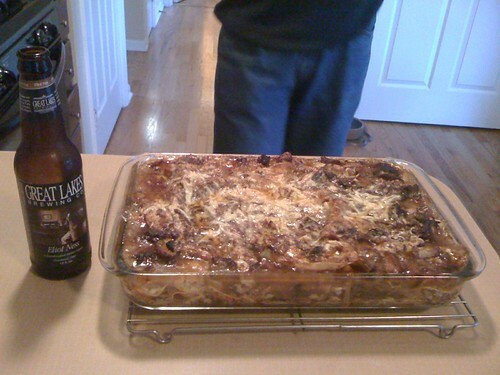 Apparently Jen's father had taken the opportunity to make a short rib lasagna for dinner last night. My sister-in-law sent me this picture to try to rally me to her militant vegetarian cause in talking about how disgusting this was. This had the opposite of her desired effect. Of my sister-in-law's many positive traits picking her audience is not one of them. 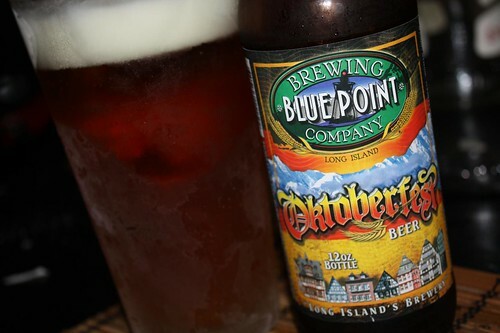 Tonight was a scrobbled together pasta and salad affair and an opportunity to try yet another Oktoberfest beer, this time from Blue Point Brewing Company. It is good but not exactly the ideal match for gnocchi with tomatoes and ricotta. However, if the flow of this dinner was at all inconsistent then tonight will pale in comparison to the Frankendinners we are about to witness. I saw the title of this and my first though was Dad's short rib lasagna as I got the same texts from Bunny. I was unfortunately talking to Dad online while he was making it so our conversation was filled with things like "gotta go shred the meat." and "several good marrow bones left, lots of good meat noises." I started the conversation to ask him what "unclassified potatoes" ment, not to get a play by play of meat preparation. Good to see him drinking an Great Lakes Brewing Elliot Ness though. Solid beer that one. 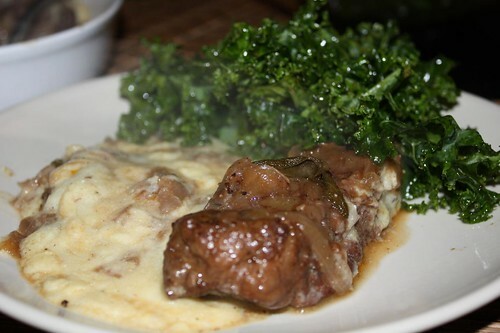 It would be a great honor to get a dish mentioned in your blog. A picture is beyond my wildest dreams.